There are many points of interest in the Seattle area which appeal to active adults. Seattle may not fit the typical picture of a retirement haven, but not all retirees share the same taste in ideal locations. Seattle is a thriving urban center which features distinctive shopping, dining, and cultural attractions, as well as breathtaking views of the Puget Sound and the Cascade Mountains. While there was a time when age-restricted communities were mainly found in arid desert locations or along sunny coastal shores, today’s retirees are looking for more diversity. Many active adults are choosing to age in place instead of relocating to a warmer climate, and even those who do relocate may opt for a favorite urban area over a typical sunny destination. That means active adult community developers are beginning to branch out into new territory, offering the same resort-style living in many different states and diverse climates. Seattle may have cooler temperatures, but its winters are more wet and mild than snowy and cold. While the city has a reputation for being rainy, most of the rainfall occurs during the winter months when average temperatures are in the mid-40s. Summers are also relatively mild with average daytime highs in the mid-70s, but temperatures can often climb into the 80s, especially just east of the city. There are many points of interest in the Seattle area which appeal to active adults. First-time visitors and new residents shouldn’t miss a trip to the Space Needle’s Observation Deck which offers an unparalleled view of the city below. They may also enjoy getting a cup of coffee at the original Starbuck’s storefront, taking a ride on the Seattle Monorail, or taking a whale watching cruise on the Puget Sound. Active adults who live in the Seattle area will enjoy having all of the city’s diverse cultural and recreational attractions at their fingertips. They can explore the city’s various museums, attend the symphony or theater, dine in fine restaurants or spend the day shopping in both local and large-chain stores. Sports fans can cheer for many local professional teams including the Seattle Seahawks, Mariners, and Supersonics. Just outside of Seattle, retirees will find some beautiful active adult communities. Trilogy at Redmond Ridge, just 20 minutes east of the city, is a spectacular age-restricted community which includes an amenity-rich, 32,000 square-foot clubhouse, an 18-hole championship golf course and plenty of diverse social and recreational activities. Those who want to live a bit further from the city will also find beautiful homes and fabulous amenities at the lovely Shea Homes at Jubilee community in Lacey, Washington. While Seattle may not fit the mold of a typical retirement destination, this thriving city provides plenty of attractions to support an active adult lifestyle. 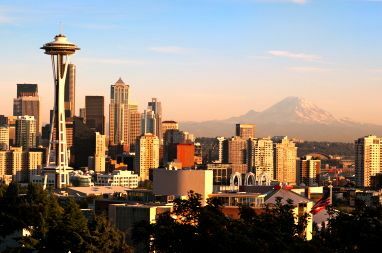 Between the urban attractions and the beautiful scenery of the Cascade Mountains and Puget Sound, the Seattle area is a lovely place to visit and a uniquely charming place to live.